ACTION ALERT! 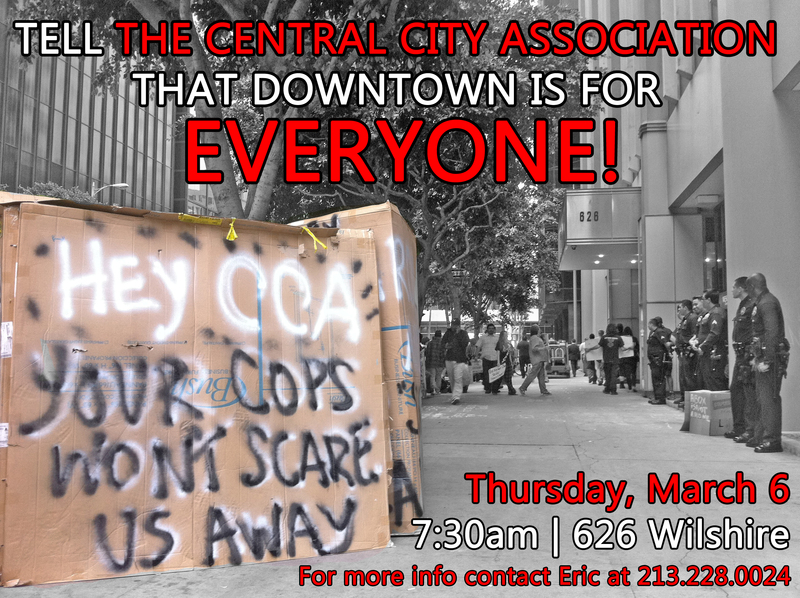 Tell the CCA that Downtown LA is for EVERYONE! Join us THIS THURSDAY as we call out the Central City Association for their continuous efforts to push low-income and homeless residents out of Downtown LA! Most recently, the CCA pressured the LA County Board of Supervisors to back out of a plan that would have provided housing for up to 500 homeless and extremely low-income people at the Cecil Hotel in Downtown LA. LA CAN and Cecil tenants worked hard in recent years to ensure that the Cecil Hotel remained protected from conversion and demolition. It is protected from demolition as part of the City’s Residential Hotel Ordinance and cannot be significantly altered with ensuring affordable housing (either on-site or through replacement units). Instead of continually calling for more police that can do nothing to end homelessness or poverty AND calling for an end to affordable housing production in DTLA, the CCA should support and invest in solutions that serve EVERYONE and uplift all of us in Downtown LA.